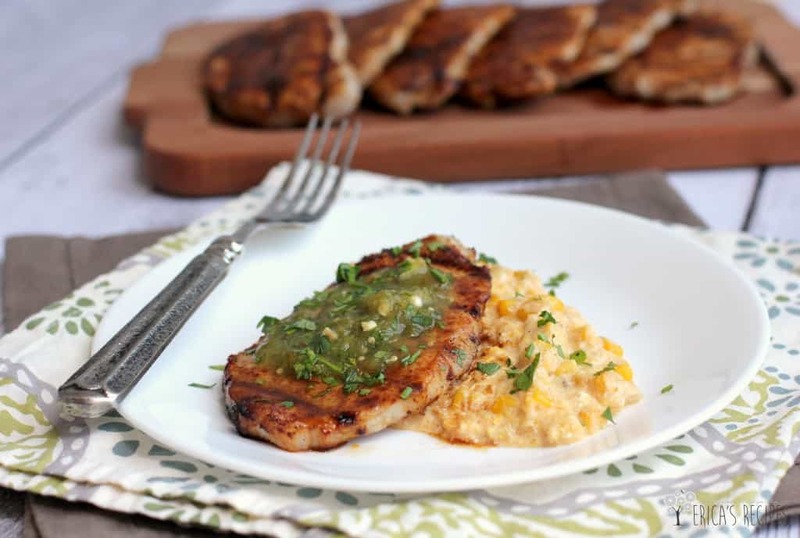 This Coffee-Rubbed Pork Chops over Creamy Queso Corn recipe is all summer baby! 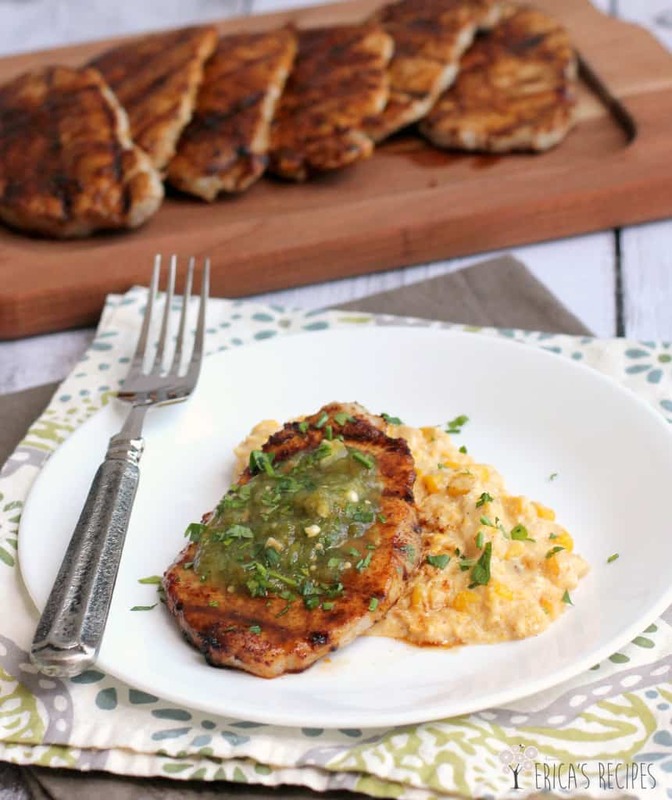 Easy grilled pork, bright fresh salsa, and creamy cheesy corn – all super easy to cook so you can get right back to the summer fun. I keep little plastic containers of my own grilling rubs for pork and chicken and taco seasoning stocked in my fridge. That way, I’ve always got them there to throw on whatever I am going to throw on the grill. 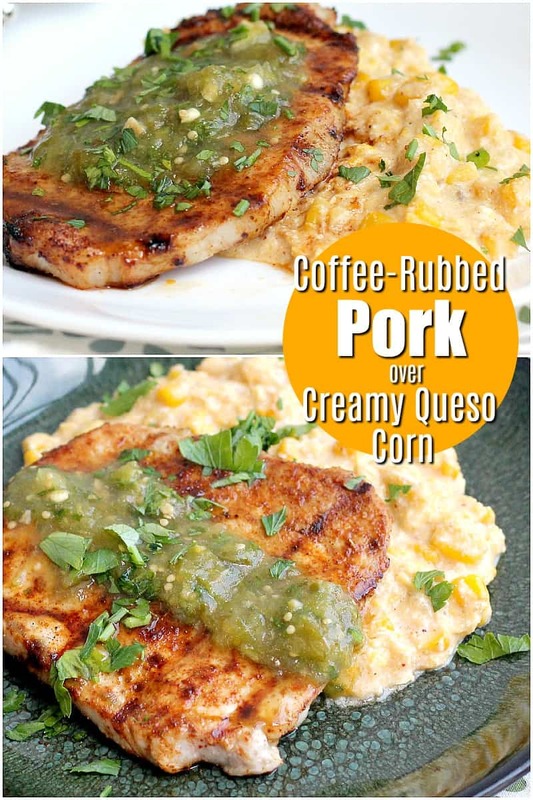 Homemade rubs and seasoning mixes are more flavorful than storebought, as are homemade salsas, but you can replace the grilling rub and the salsa with storebought if you desire. The point of this dinner is easy yumminess! The components of this recipe are all easy to assemble and can be assembled in advance making this a great company meal. And I used thin-sliced pork loin chops which don’t need to be brined and cook very quickly. So when you are ready to eat, just grill the chops right up, mix up a cold drinkity drink, and you are done! 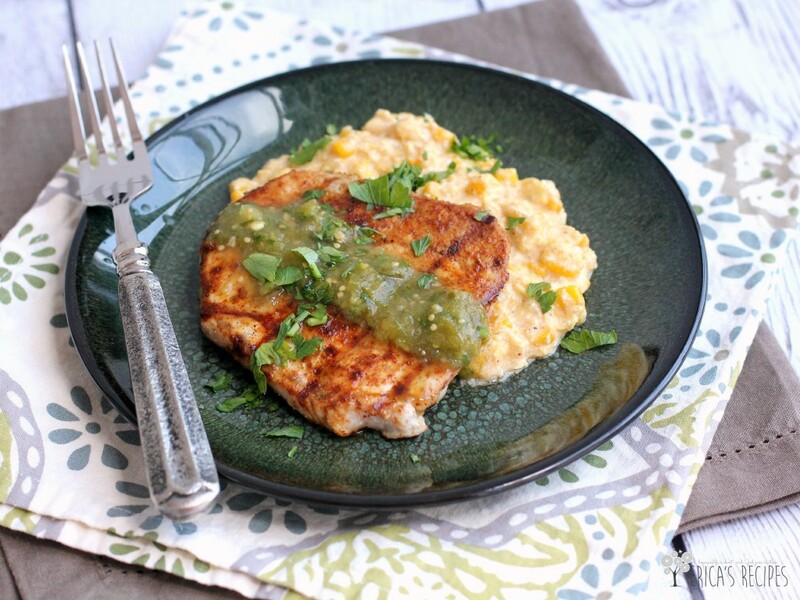 And the flavors here are amazing of course – especially the tangy tomatillo salsa balanced with sweet and creamy corn – sooo delicious! In a small bowl, combine the Grilling Rub with the espresso powder. Very lightly coat the pork chops with a little olive oil. Coat the oiled pork chops in the coffee-rub mixture and set aside at room temperature. Meanwhile, heat the grill to high heat. While the grill is heating, prepare the corn. Heat the olive oil in a large saucepan over high heat. Add the corn and onion and cook, stirring regularly, until corn is lightly browned and the onion is softened. Remove from the heat. Transfer half of the corn-onion mixture to a bowl or plate on the side. To the corn remaining in the pot, add the queso fresco, cream, salt, cumin, and chili powder. Using an immersion blender, process the corn mixture in the pot until smooth (alternatively, this can be done in a blender or food processor). Return the whole corn mixture to the pot and stir. Keep warm until ready to serve. Grill your chops, turning once, until just cooked through, ~1-2 minutes per side depending on thickness. Serve over creamy queso corn topped with Roasted Tomatillo Salsa. Yield: 4 servings. I’ve always wanted to try a coffee rub, maybe this is the recipe to try. Sounds tasty. I make my own rubs and seasoning mixes too. They don’t contain as much sodium and words that I can’t pronounce! Tis looks great! This looks so simple and yummy! And, that creamy corn queso look fabulous! I can’t wait to try that. Pinned and stumbled. This looks super yummy! And I just love your photos! Thanks for Linking with us at #FoodieFridays! I absolutely love how summery this recipe is, as well as how quickly it can come together if you’ve got all the ingredients. 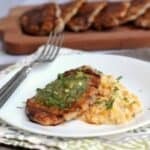 I haven’t had a pork chop in a long time, and I now want one… so yay! This was one of my favorites from last week’s #thatsfreshfriday link-up! 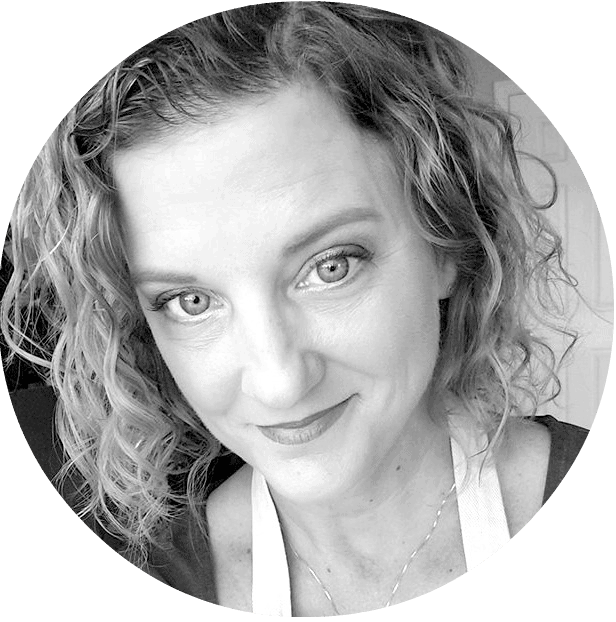 I’ll be sharing it at my blog tonight, and I hope you come join in on the party again this week. Keep up the great work!